Analyse the complete catalogue of each of your online competitors, filtering by brand and categories. Thanks to our crawling technology you can access any structured information that appears in your competitor´s websites of your competitors, like price, stock, brand, category, SKUs, EANs, MPNs, descriptions, among others. For each product you can consult its price and stock history, helping to determine the long term strategies of your competitors. Be the first to know the novelties that each of your competitors have incorporated and react on time. With our matching algorithm you will know which products you have in common with your competitors. This way you will have a direct vision of those products that are the most competitive and also of those products in which you have an advantage in position. Also, it will detect trending products in the competitor's e commerce that you do not have, helping you to construct a competitive and beneficial product assortment. Set of configurable graphs designed specifically for the analysis of product assortment in the competition. Among many functions, you can know the growth and assortment rhythm in your competition, helping you to fix prices for new releases of products. 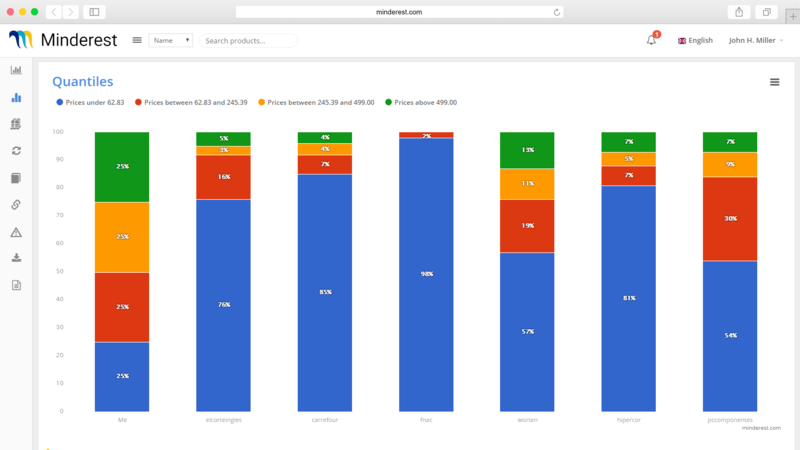 Visualise how many products your competitors have in their catalogues, how many novelties they incorporate each month, how dynamic their prices are, what percentage of availability they have or how many prices they update per day. Configure unlimited alerts and reports specialised in catalogue analysis that will notify you by email when your competitors incorporate new products or changes are produced in price or stock. Design your own custom reports by selecting which fields you wish to export and with what frequency, disposing of however many reports you may need from our report manager. Export the complete catalogue of your competitors in just one click, having access to all of the captured information. 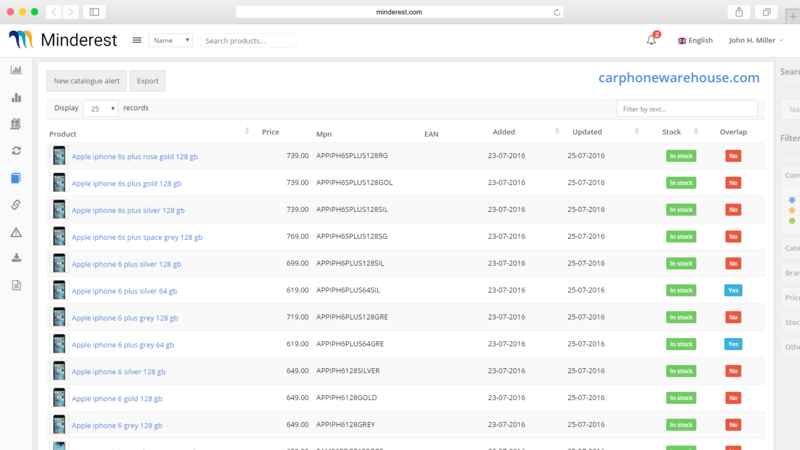 If you wish you can integrate your systems easily via our API connection, allowing you to enrich your catalogue with EANs, MPNs, SKUs, images or descriptions obtained from your competitors e commerce.